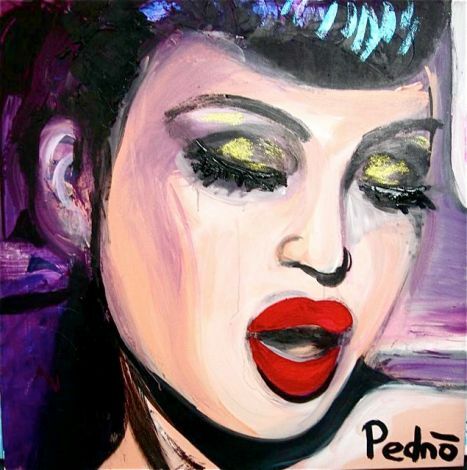 Violet, by Montreal artist PednÃ². A website where local Montreal and Toronto artists can exhibit their work for free is turning the curatorial model of art collecting on its head. ArtAnywhere.com does away with curators and galleries, bringing buyers together with local artists. Prospective art-collectors can browse all the artists' collections and then have the option of either renting or buying the work. With the objective of making it easy and affordable to simultaneously support Canadian art communities and build a personal art collection, ArtAnywhere encourages us all to adorn our apartments with local art. The site offers emerging local artists increased visibility to buyers outside of the art world and an easy way to get their work seen. "I see a lot of empty walls in offices and boardrooms, not to mention living rooms, and during a studio tour of a local artist I realized that almost all of his art was hidden in storage. Putting the two together, I wanted to find a way to get that art out of the closet and onto those empty walls," says founder Raymond Luk. "I wanted an emphasis on local art because I think actually meeting the artist is a great thing for one's appreciation of art." Though viewing art online may seem more detached and less personal than the gallery experience, ArtAnywhere actually provides greater opportunities for client-artist interaction than most galleries. The site connects buyers or renters with their chosen artist, who then delivers their work--often in person--or offers the client the opportunity to pick the work up directly from their studio. It can be as difficult for emerging artists to break into the art market as it is for struggling musicians to get a record deal. ArtAnywhere, however, is looking to change that--Montreal and Toronto artists can freely submit their work to the site. "We don't select the artists--the artists select themselves," says Luk. "We are an uncurated gallery by choice because we believe artists know best how and where to share their art. Our site empowers artists to be their own curators, present and price their work according to what they believe... Artists put their stuff out there and if people like it, [the artists will] rent it out or sell and be encouraged to put more stuff out there." So far, the site has been overwhelmingly successful. "A lot of people have very strong feelings about art, mostly positive, and they see our site as the way to bring more art to more people and help support local artists at the same time."